The VinylPlus® Product Label is a labelling scheme that makes it easy for customers and markets to identify the most sustainable and high-performance PVC products. The label has been developed to ensure a company’s overall policy and performance, as well as the component materials used for its products, are aligned with sustainability criteria. Epwin Window Systems has achieved VinylPlus Product Label certification on its three leading profile brands – Profile 22’s Optima, Swish Window and Doors Systems’ 24/7 and Spectus’ Elite. The systems house was one of the first businesses to apply for the VinylPlus label and one of the first to achieve certification. The award was announced at the industry’s prestigious ceremony held at the London Hilton Hotel on Park Lane in London. 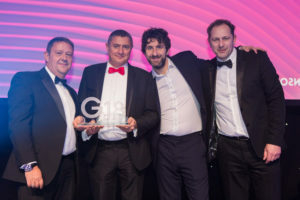 As Gerald points out, it’s the third G Award in a row for Epwin Window Systems – the company won New Product of the Year in 2016 for Optima from Profile 22 and Training and Development Initiative of the Year in 2017 for helping 253 employees successfully achieve NVQ Level II qualifications. Registered Office: 1B Stratford Court, Cranmore Boulevard, Solihull, B90 4QT.